To fulfill my idea of doing a post about how married women cover their hair, I am writing this. However, the main idea of the posts about head coverings will hopefully be reached when I do my next big post. The first, and possibly most common way, is with a tichel. 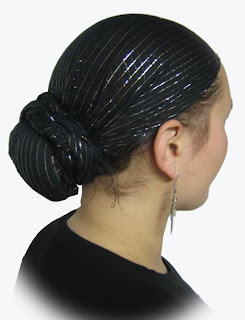 A tichel is worn by women who are Modern Orthodox, ultra-Orthodox, and Chasidic. The only difference might be the way in which they are worn and the times when they are worn. 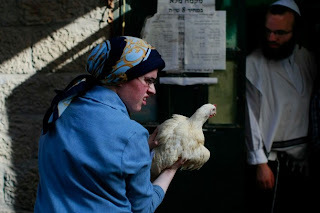 Among the more ultra-Orthodox, wearing a tichel might seem to be a more lenient way of covering the hair, but is also seen as more stringent by others. The legal opinions regarding hair coverings are diverse, and often grow out of the place in which each group originated (Poland, Russia, Iran, Morocco, etc.). Among the more strict ways of wearing a tichel is found amongst the most stringent of communities, such as Yerushalmis (addressed in the previous post), Nikolsburg, some groups within Satmar and Skver, and so on. This is done by either wearing a tichel wrapped around a sort of foam substance to give the forehead lines and other parts a more full fill so that they do not slip, or is worn with a small, quasi-wig underneath, which is only visible at the front. In either case, women who choose this method tend to shave, or very shortly shear, their hair. Another way of covering the hair is with a snood. 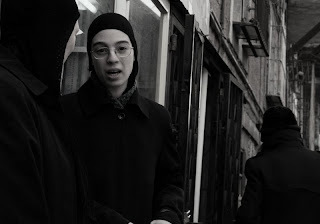 Snoods are generally worn by more ultra-Orthodox women, especially in times of being lazy, working around the house, cooking, etc. as they are probably the easiest way to cover the most hair effectively. There are various other ways to cover the hair, such as placing the hair into tight, stocking-like caps, and then wearing berets, snow hats, and other things. This is done commonly, and is probably found more among religious Sephardic/Edot HaMizrach (those originating in North Africa and the Middle East) women. The most controversial way, though a very popular method, is that of the sheitel, or wig. 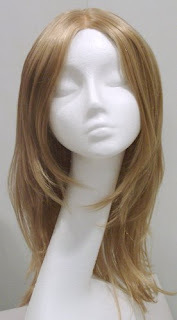 Wigs come in all cuts, sizes, colors, and materials. For those who are more lenient and into style, a human hair sheitel, made to fit, professionally styled, and hand woven can cost into the thousands of dollars. For those against sheitels, the argument generally focuses on the attractiveness they add to women. Afterall, they are hair. Some women offset this by wearing synthetic wigs, but either way, they do look like hair. This claim is often made by Sephardic Jews. Those who are most in favor of wigs are Lubavitchers. For them, wigs are the most preferred as they are the "most unlikely to be removed", as they require alot of effort and make the hair underneath matted. I'm not sure that a fake only-bangs sheitel, covered by a foam mass, then covered by a tichel is any easier to remove, and leaves the hair looking any nicer, but who am I to argue? 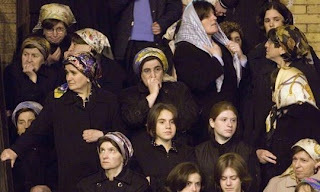 Some women also cover their sheitels with hats, especially during religious events, as a way to counter the "leniency" of a sheitel. I knew I would learn from this entry as well. Very nicely written and yes I have to agree "Who am I to argue" you know when a women put her mind to something that is just about written in stone. I think either way choosen is nice because I have seen a few differnent ways the hair had been covered and each I thought looked very nice. Thanks and Love ya Mom.